Audiobooks are appealing to all age groups. But today we’re focusing on our youngest listeners – Kindergarten and elementary school aged students. These students are just learning to read and write. They’re working on building vocabularies, fluency, and context. 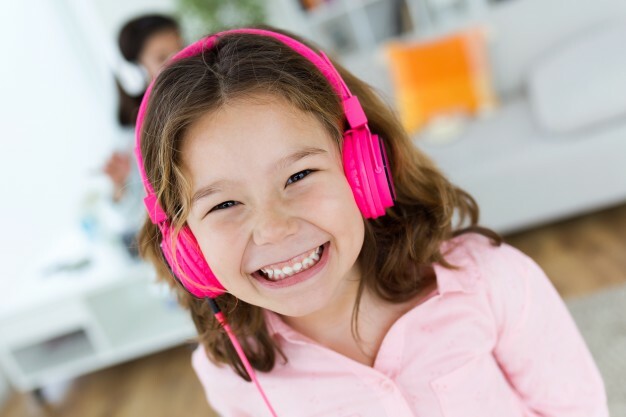 Audiobooks can provide these supports by relieving some of the frustration of decoding, making literacy activities more enjoyable, and laying important foundations for improved language learning. At this stage, it’s important to encourage lifelong habits for reading, listening, and language building. Having access to books and stories is of primary importance. Easy access and a varied selection make it much more likely that students will pick up something that piques their interest. As Teri S. Lesesne points out, “access is not just physical” – students need to be able to understand and relate to the content of the stories. “Readers need windows and mirrors and doors in books” to grab and maintain their attention. Multicultural stories validate children’s experiences and provide characters to whom they can relate. We also know that young children’s behaviors are very much shaped by their role models’ activities. Students whose family members and teachers model reading and listening behaviors are more likely to be curious and engage in those activities themselves. For very young children, this might involve group listening in the classroom or family listening and story time. Just seeing the adults in their lives enjoying reading and listening is a good starting point! Listening to stories in lieu of music can be an easy way to incorporate literacy by making educational use of otherwise ‘lost’ time. Another thing to consider is that the road to fluent reading and language acquisition can have pitfalls and frustrations. Help pave the way for younger students by removing as many barriers as possible. For example, burgeoning readers might feel anxiety about starting longer books. Consider an abridged version, and then following a spiral curriculum, read the unabridged one to conclude the term or section. The Tales2go catalog includes multiple versions of many classic titles, both abridged and unabridged (see some examples below). Having access to several versions of the same story also means students can pick a narrator whose voice is more appealing to them. The Tales2go advanced search options allow you to choose titles by duration to best fit your time allotment and attention span, too! This individual listening allows students to listen at their own pace, making the experience and learning inherently differentiated and giving students autonomy. Below are some ideas for themed activities to help get you started. In addition to thinking about content themes, it can be helpful for young readers to focus on phonemic and literary themes as well. For example, rhyming words are often a point of interest with early readers, especially as they learn about spelling and homophones. Check out our teacher resources for some activities about rhyming words! A study of winter and snow lends itself perfectly to STEAM activities. Get students started on an activity and listen to winter stories to set their imaginations going! Building with 100 cups – use paper Dixie cups and then plant seeds in them to recycle! 100 days necklace – count out and string 100 beads onto a string to commemorate the day. Bonus: once the beads have been counted out, stringing them is a great listening activity! Many 100 days activities that make great quiet activities to pair with listening time!